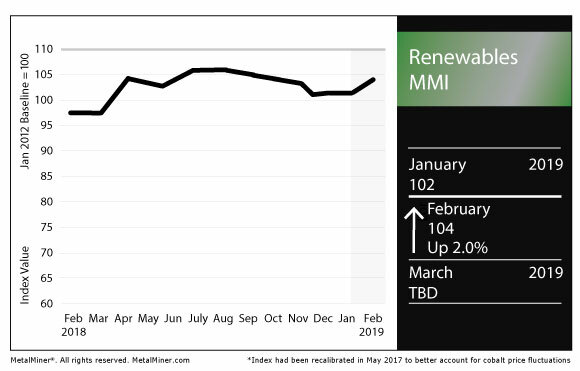 The Renewables Monthly Metals Index (MMI) picked up two points this month, rising for a February MMI value of 104. According to a Bloomberg report, miner Glencore plans to cut its workforce at its Mutanda copper and cobalt mine in the Democratic Republic of the Congo (DRC). According to the report, the miner is looking to invest in technology for cobalt extraction from sulfide deposits rather than from the oxide ore found at the Mutanda mine. Nonetheless, it’s been a rocky year for cobalt miners in the DRC, as the government revised its mining code to nearly triple the royalties miners must pay on cobalt. In addition, the country held a presidential election in December that resulted in a victory for Felix Tshisekedi; however, the results of the election remain disputed as the country looks to move on with a successor to Joseph Kabila, who stayed on as president two years past the end of his mandate. Political instability in the DRC would contribute to rising prices for cobalt and make the price of doing business much higher for miners like Glencore; political developments in the DRC should be monitored by cobalt watchers (not to mention copper and coltan). As Belinda Fuller noted this week, plate prices have gone against the general downward trend for most forms of steel. 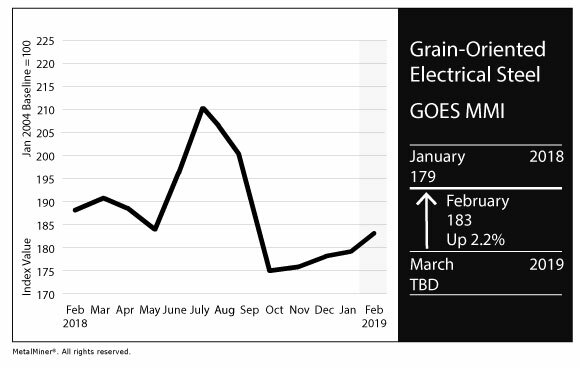 While CRC, HRC and HDG have been on the decline in the recent months, plate prices have been on the upswing. The proposed joint venture between German firm ThyssenKrupp and India’s Tata Steel — in which the two firms would merge their European operations — has reached the stage of review by the European Commission’s competition authorities. According to a Reuters report, ThyssenKrupp CEO Guido Kerkhoff said the company has had constructive talks with the European’s European Commission on the proposed joint venture. GOES is used in transformers and large generators. 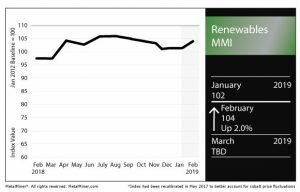 The price of U.S. steel plate moved up 2.1% month over month to $1,015/mt as of Feb. 1. Japanese steel plate jumped 0.8% to $790.09/mt. Korean steel plate fell 8.4% to $575.45/mt. Chinese steel plate rose 1.9% to $619.02/mt. The Chinese neodymium price jumped 2.0% to $59,366/mt. Silicon rose 2.6% to $1,536.37/mt. Cobalt cathodes rose 2.6% to $99,192.90/mt. 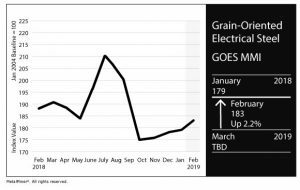 U.S. grain-oriented electrical steel rose 2.2% to $2,520/mt.